While heel pain has many causes, it is usually the result of faulty biomechanics abnormalities in the way we walk) This can place too much stress on the heel bone and the soft tissue attached to it. Heel pain is probably the most common and disabling foot problem in Australia today. Since the heel is the largest bone in the foot, it bears the most weight when you walk. Weight gain, aerobics, standing at work and many other activities such as constant walking and standing can all put a large amount of stress on the heel bone. 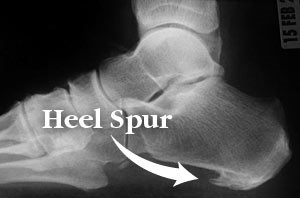 This can cause pain and often a bone spur forms on the bottom of the heel. Probably the most prevalent of heel problems is a condition known as Plantar Fasciitis. The Plantar Fascia is the thick, inflexible fibrous material on the bottom of the foot connecting the toes and the heel. This is a pictorial drawing of the foot showing the bone structures and the plantar fascia ligament as it extends from the ball of the foot to the heel bone (calcaneous). towards the toes. Heel spurs are visible on X-ray. It is important to note that the heel spur is the RESULT of the problem and not the CAUSE! The pain of Plantar Fasciitis may cause you to try to walk on your toes, or alter your walking stride. Gait changes in running may also lead to ankle, knee, hip or back pain. If your foot flattens or becomes unstable during critical times in the walking or running cycle, the attachment of the plantar fascia into your heel bone may begin to stretch and pull away from the heel bone. This will result in pain and possibly swelling. The pain is especially noticeable when you push off with your toes while walking, since this movement stretches the already inflamed portion of the fascia. Pain can be also encountered with the first few steps in the morning, or when arising from a sitting position. Without treatment the pain will usually spread around the heel. The pain is usually centred at a location just in front of the heel toward the arch. The most frequent cause is an abnormal motion of the foot called excessive pro-nation. Normally, while walking or during long distance running, your foot will strike the ground on the heel, then roll forward toward your toes. Your arch should only dip slightly during this motion. If it lowers too much, you have what is known as excessive pronation. The mechanical structure of your feet and the manner in which the different segments of your feet are linked together and joined with your legs has a major affect on their function and on the development of mechanically caused problems. Merely having “flat feet” won’t take the spring out of your step, but having badly functioning feet with poor bone alignment will adversely affect the muscles, ligaments, and ten-dons and can create a variety of aches and pains. Other factors which may contribute to plantar fasciitis and heel spurs include a sudden increase in daily activities, increase in weight or a change of shoes. Dramatic increase in training intensity or duration may cause plantar fasciitis. Shoes that are too flexible in the middle of the arch or shoes that bend before the toe joints will cause an increase in tension in the plantar fascia. Make sure your shoes are not excessively worn. These shoes and other shoes that are not sufficiently controlling of pronation combined with an increase in training can lead to this condition. The most common and effective treatment of plantar fasciitis is orthotic therapy. Orthoses help reduce the stress on the plantar fascia and help stabilize the arch. Once the arch is stabilized, there is less tearing of the fascia. Our Podiatrists will know what style of orthoses is suited to your lower limb biomechanics. They will also prescribe specific exercises and advise on appropriate footwear. Short term strapping may also help to provide pain relief. For an appointment with our Podiatrist James Pascoe or Cameron Bell, please call Rathmines Physiotherapy on 4975 1622 or make an appointment here.